We are happy to completely design and prepare the print-read artwork required to give the best results. However, if you wish to supply your own print documents, here is some useful guidance. You can bring your artwork directly to our London Print Shop on a memory stick or send it by email. Alternatively, use our Upload Facility if the file size to too large to be sent via email. Print artwork is required preferably as a print-ready PDF. For best results we recommend high resolution 300dpi including bleed and crop marks where appropriate. Adobe InDesign – Save as a ‘Package’ and zip the fonts, images and InDesign file in one file. Or export ‘Press Ready’ PDF from InDesign including bleed and crop marks. InDesign documents without linked images and fonts will not be accepted. Adobe Illustrator – supplied as AI or EPS files. Or save as ‘Press Ready’ PDF from Illustrator including bleed and crop marks. Quark Xpress – Collect for Output and zip fonts, images and Quark file in one file. Or output ‘Press Ready’ PDF from Quark including bleed and crop marks. Quark documents without linked images and fonts will not be accepted. Adobe Photoshop – layers flattened, at least 300 dpi at correct, JPEG, PDF or Tiff. Remember to include 3mm bleed. PSD files can be supplied – please advise if your artwork contains layers and include any font used. Corel Draw – fonts converted to Curves then export as Illustrator AI or EPS file. Pixel Based Programmes – i.e. Photoshop/Paint/Gimp. Ensure the original artwork is ‘press ready’ at 300dpi and includes 3mm bleed area. CAD drawings for plan printing must be supplied as PDF. We do not accept DXF, DGN, DWG or any native CAD format. Artwork must be supplied with at least 300dpi (dots per inch) at actual size and with maximum quality settings. 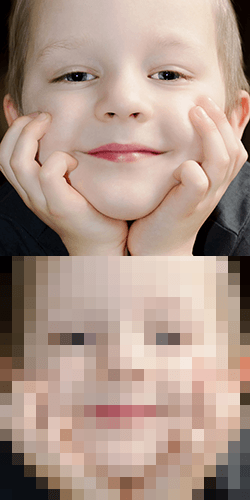 Images acquired from the internet is very often inadequate for professional quality print and will result in pixilated, low-resolution images that lack detail. If you supply low resolution images that are to be printed big such as posters, pullup roller banners, vinyl PVC banners or foamex displays, then the result may be very disappointing. We can scale artwork down, but up-scaling images will not successfully return the detail which has been lost. High resolution is what makes the image sharp and crisp. Also, older mobile device cameras may lack the resolution and quality required for print. Always use the highest quality setting available send or export with original quality settings. 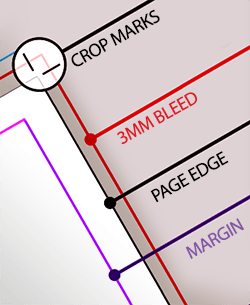 Bleed is the small amount of extended area that goes on all the outer edges of your printed piece and then cut away. Where an image or colour is required to reach the edge, 3mm bleed must be used. Edge to edge printing is not how professional commercial print is achieved. Instead we print on a larger sheet of stock and then trim it down to the correct size. This ensures your printed item does not have unsightly white edges along the sides. Crop marks, also known as trim marks, are lines printed in the corners of your artwork, away from the print area, to indicate where to cut. Borders or dotted lines are not acceptable on artwork and may show after being trimmed. Please ensure that all images used are in CMYK (Cyan, Magenta, Yellow, Black) as these are the ink colours used for standard print production. 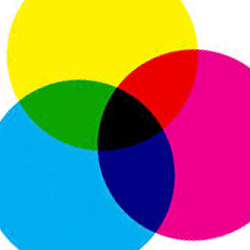 RGB images may look good on your screen but final output to print is always in CMYK. Be aware that files converted from RGB to CMYK may change the colour appearance. Spot Pantone print artwork must be set to separate correctly and not as RGB or CMYK. If you require advanced information regarding print profiles, spot colour or colour matching, please contact us directly. Please ensure your artwork is set to the correct physical size and just ONE artwork per page. Where appropriate, and to give best value with paper stock usage, we will print as multiples per page. However, it is best for us to determine this process and prepare the final artwork for our workflow. Creating artwork at a different size to that of the final output size can also cause problems. Frequently artwork is repurposed for different items such as existing A1 poster artwork used for an A5 flyer. This can be done, however the smaller text on the original poster may not be readable when reduced to the new size. Please supply your document as single pages in the correct running order, not as double page spreads. Do no not supply imposed pages or ‘printers pairs’ because our workflow includes imposition software to impose correctly for our printing methods. Please keep text and important elements away from the edges, 7mm to 10mm ‘safe area’ margin is recommended. Booklet printing is based on folded sheets, therefore the amount of pages will always be a multiple of four, including blank pages i.e. 4 page, 8 page, 16 page 24 page etc. No, we cannot print a 7 page or 33 page booklet due to the laws of physics and interdimensional reality. Occasionally, actual size artwork for very large items such as vinyl banners or signage panels is not achievable due to the limitation of the design application. Print ready artwork can be supplied at 25% of the final physical size and with 5mm bleed. Please check your artwork is kept at the same proportion. Vector based artwork produced in applications such as Adobe Illustrator are preferred for very large items. Standard roller banner display area 850 mm × 2000 mm with crop marks and 5mm bleed on top and side edges, 150 mm bleed on bottom edge. Banners are usually given a welded hem, then eyeletted at equal distributions along the hem. A selection of print templates will be available soon.